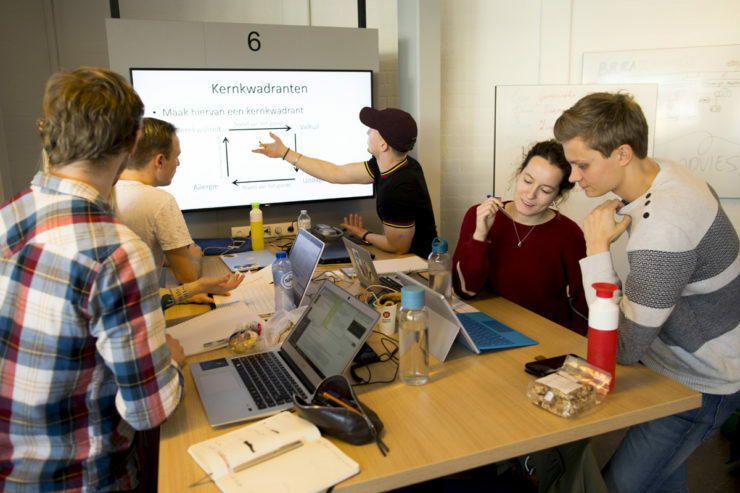 When Jasper van Winden started experimenting with a flipped classroom in his courses, the activating learning methods didn’t quite pan out, because his lessons were held in traditional auditoriums with rows of seats and the lecturer standing in front. So he spent two years converting the Teaching & Learning Lab (TLL) into an Active Learning Classroom (ALC). That proved so successful, that Jasper has now converted a lecture hall at Utrecht University into an ALC as well! In an ALC, the lecturer stands in the middle of the space, which reduces the distance to the individual students. The students sit or stand at six-person tables, each with its own screen and whiteboard. 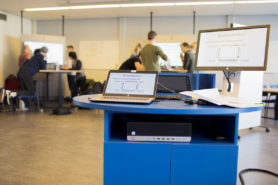 The classroom features extensive facilities for screen management: the lecturer can show his/her presentation on every screen, the students can share a screen to work in groups, and interesting work from one table can be displayed on one or more other screens as needed. This helps increase the interaction between students and lecturers, and enables the students to work together effectively. Jasper based his ALC on a handbook1 explaining the empirical research into the effects that the location has on education. These studies showed that a class taught using activating learning methods in an ALC achieves better results than the same class taught in a traditional auditorium, because an ALC elicits different behaviour from both the students and the lecturer. This includes more interactive discussion, as the lecturer is less dominant as a ‘sender’ of communication. This different behaviour in turn leads to improved learning results. Jasper copied the ALC used at the University of Minnesota as accurately as possible in the TLL, and he used it for his Bachelor’s course ‘Scientists in Consulting’. This was fairly easy to do, thanks to the fact that the TLL is a flexible space. The only difference with the situation in Minnesota was that they use round nine-person tables that are not adjustable in height, while the TLL is furnished with six-person tables that also have a standing position. Changing the students’ posture occasionally during the lessons proved to enhance the classes’ energy level. Jasper sketched his ideal classroom, then he worked with an interior architect and an AV media specialist at Utrecht University to put the definitive design on paper. 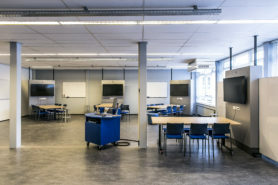 The main advantage to the new classroom is that it is fully furnished in accordance with the ALC principle, so you don’t have to rearrange the tables and chairs. “I see the TLL as the nursery for new teaching concepts at the university. It’s a place where we can try out new ideas – and just as importantly – let new ideas fail. The goal is to have successful concepts spread throughout the university, and the ALC is the first step in that direction. I think that people are starting to understand that the space determines a large part of how you teach, and that we’ll have to adjust our classrooms and auditoriums at the UU to accommodate our vision of small-scale, activating teaching”, Jasper explains. Several other innovative classrooms have already been set up at UU, and the university is experimenting with more such new concepts. Would you like to teach in the ALC? Jasper’s ALC is located at the Bolognalaan 101, in Science Park Utrecht. The room is intended for lecturers from the faculties of Science, Geosciences, and Social and Behavioural Sciences. Lecturers who would like to reserve the room can contact Jasper van Winden for an introduction to the space and scheduling options.